Thanks to a technique called ‘gravitational lensing’, Europe’s Herschel space telescope, in orbit since 2009, has been able to detect and characterize galaxies as they were 10 billion years ago. Illustration of the phenomenon of gravitational lensing, or the cosmic ‘zoom lens’ effect. Credits: NASA, Andrew Fruchter and the ERO Team. 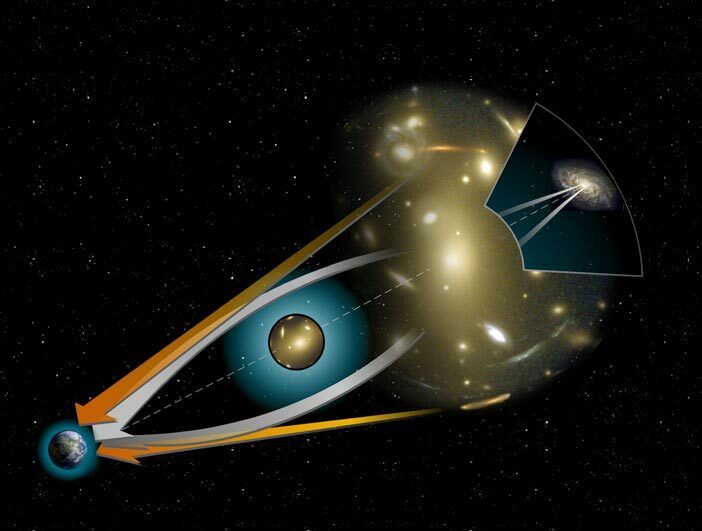 The phenomenon of gravitational lensing, or the cosmic ‘zoom lens’ effect, is one of the predictions of Einstein’s general theory of relativity: light is “bent” when it passes close to a massive object. The image of a very distant object is thus amplified, and possibly distorted, if a massive object is located between the source and the observer. The five galaxies discovered by the Herschel-ATLAS science team and reported in the 5 November issue of Science. Credits: Herschel - ESA. The Herschel-ATLAS project, in which French researchers are involved, supported by CNES, uses these cameras to identify very bright sources at submillimetre wavelengths. It appears that a number of the brightest sources are amplified by gravitational lensing. 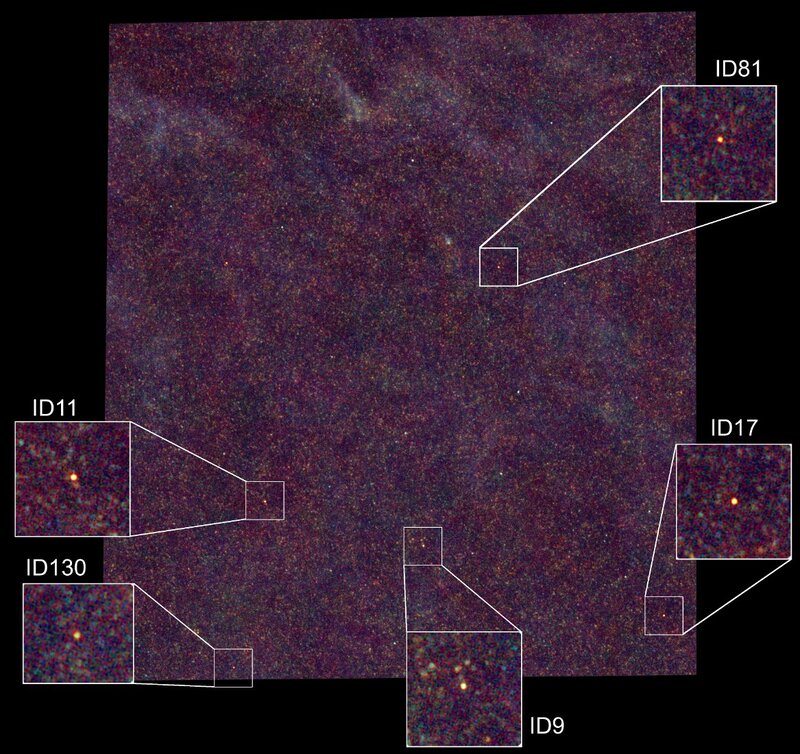 Observing candidates in the visible range, using telescopes on the ground, astronomers found galaxies that should not emit radiation at the wavelengths observed by Herschel. Their conclusion is that these galaxies are acting as gravitational lenses, amplifying other much more distant galaxies. 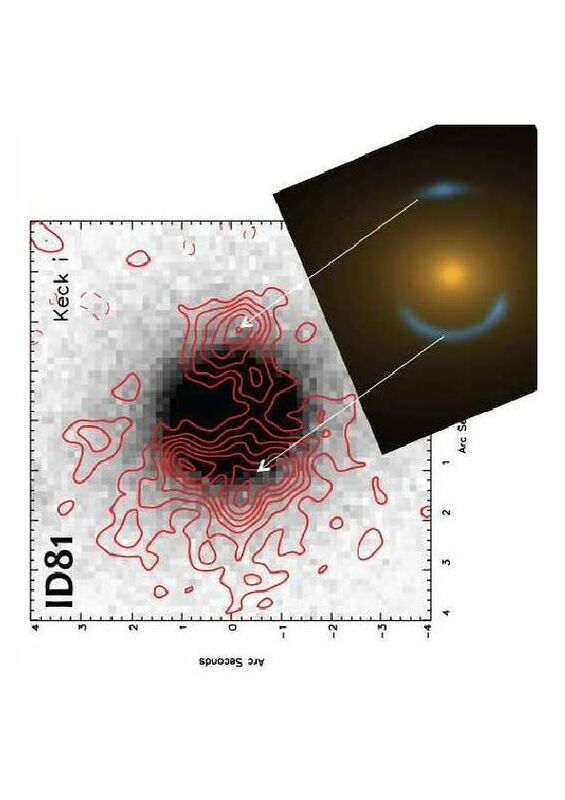 Hidden behind object ID81 is a far-distant galaxy, whose image is amplified by a nearer galaxy, due to the phenomenon of gravitational lensing. Credits: KECK. Without these lensing effects, such distant and dark galaxies would be undetectable, effectively drowned out by their nearer and brighter counterparts. And this is just the start. In fact, Herschel has only covered 1/30th of the total survey region and will continue these observations for almost the entire operational life of the telescope, with hundreds more gravitational lenses likely to be discovered. The next step will be to submit the most interesting objects to the piercing gaze of the future ALMA ground-based interferometer in Chile, which will study them in even closer detail.